Herb McLeod lives in western Canada and likes to tease the rest of us with photos like the one above. Beautiful! Here is his RB42 out camping with two aboard. RB42 is a row boat for two! The prototype was built by Herb McLeod of Edmonton, Alberta. Look closely and you will see a lot of my Toto canoe in RB42. I has the same long lean bow and multichines for smoother going in rough water. The stern is wider on top but the lines of these boats at the water always sweep upward and taper to nothing. The stern has a buoyancy/storage volume with a hatch. The bow has another buoyancy/storage area with access through a deck plate in the bulkhead. 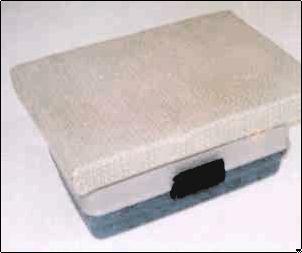 A thinly padded board is mounted to a standard plastic toolbox. The seats shouldn't be too high, I've usually made mine about 9" high but that would vary by person and boat so some experiments are needed on the trial runs. As I recall, Herb's seat has a little trick to it - the seat is actually attached to the bottom of the box. So if the box is turned over, the top is available and it can be used then as a regular tool box. 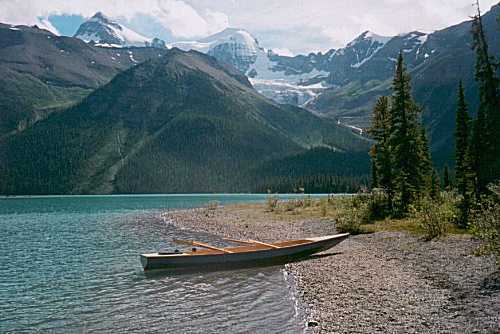 Although designed to be rowed by two people, this boat might be fine with a solo rower in many conditions. The long waterline should give extra speed over a shorter boat, although it's not all that simple. Frictional area might be increased and windage drag should increase over a shorter boat. But RB42 is a bit lower and sleeker than my other designs so it's hard to tell. Herb had to tinker a bit with the seating and oarlock locations, something any rowboat builder will likely have to do. In the end he moved the locks aft 1' from what is shown in the first photo. 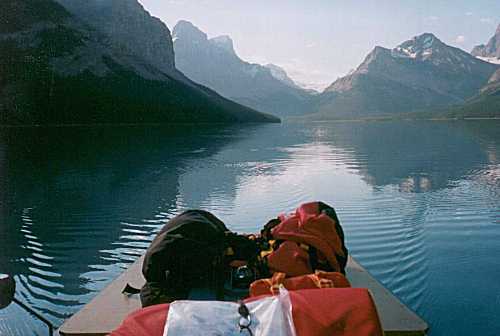 Solo rowing is fine from what is shown above as the original aft location. Seating in almost all my rowboats is on movable boxes that simply rest on the floor so no revisions of seating structure was needed. In addition when the seat boxes are removed, the boat is totally open between the bulkheads. I got the idea a long time ago from reading Bolger, who got the idea from Herreshoff. RB42 is built with taped seams from six sheets of 1/4" plywood. No lofting or building jigs required.